PRIVATE WiFi™ protects a computer user's identity online and secures their information by encrypting all the data going into and out of their computer. It makes them invisible to hackers on any public network anywhere in the world. We offer a subscription-based Virtual Private Network (VPN) service that works just like antivirus software that everyone uses. Affiliates can earn up to 55% of all sales for the first four months (with exceptions for special promotional campaigns/banners), or up to 55% of a yearly subscription sale. Recurring sales are paid out to the affiliate via bonuses. We also offer a download rewards model where affiliates can earn money for each download of our software. Certain creative units allow users to download the software directly from a banner ad which is in effect a pay per click payment model. Furthermore, we offer a tier 2 affiliate level that allows affiliates to refer other affiliates and earn 20% of all the earnings of their referred affiliates. This model is perfect for Internet marketing related websites and blogs that may be able to refer high quality affiliates. Tier 2 affiliates receive bonus amounts of 20% of the revenue produced by the affiliates they refer. If their referred affiliates earn a total of $100,000 a year, the tier 2 affiliate will earn $20,000 a year without ever having to sell the product. Becoming an affiliate is easy. We have partnered with Commission Junction, an industry leader in affiliate marketing, to offer you the best experience possible. 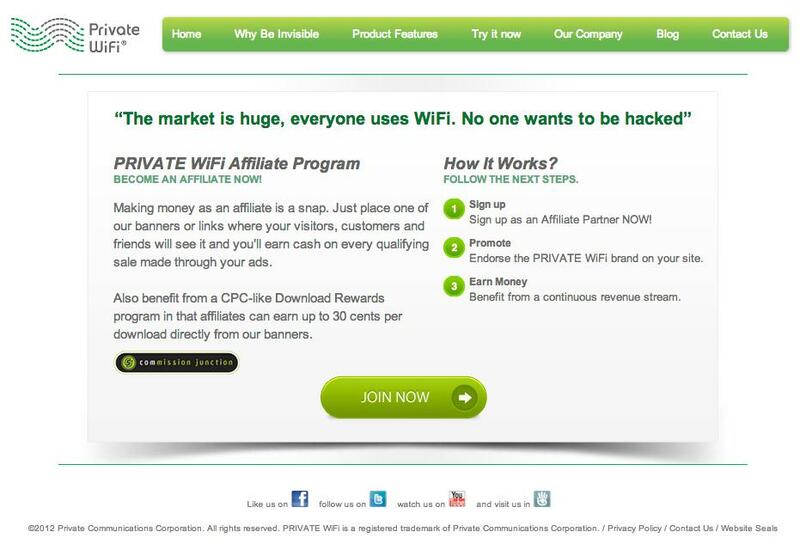 Visit our Affiliate Sign Up page at http://www.privatewifi.com/affiliate-sign-up/ and click JOIN NOW. Follow the two step publisher application process, or if you are already a member of Commission Junction, you can log into your account at http://cj.com and search for PRIVATE WiFi. PRIVATE WiFi has a wide selection of banners to choose from. You can select an advanced banner or a simple graphic or text link. Some advanced banners allow the user to directly download the software from the banner without leaving the affiliate website. Most banners link to landing pages that are continuously optimized using A/B testing. To begin using links, you can browse through the traditional CJ interface, or you can create an account using our customized affiliate dashboard. From the CJ Interface, browse the banners from your CJ account using the Get Links menu. Go to https://www.privatewifi.com/affiliates/ to register and use our affiliate control panel. Once you login, you will see the following menu options on the Affiliate Control Panel. Click CJ Link Generator to use our well-organized link generator. You can choose from static image banners, text links, flash banners, advanced banners, popups and overlays. 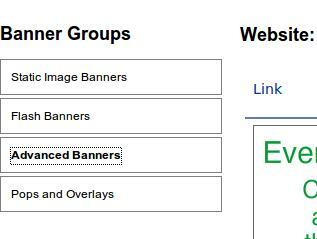 Select your desired banner and then click Get HTML Code to get the code that you need to copy and paste the banner into your website. We offer our affiliates a commission rate of 40% of a monthly subscription to PRIVATE WiFi for as long as the customer stays subscribed. For yearly subscriptions, we offer 40% of the subscription for that first year. 45% commission for more than 50 referred orders. 50% commission for more than 100 referred orders. 55% commission for more than 200 referred orders. In addition to earning a revenue share, you can also benefit from a CPC-like Download Rewards program in which you can earn up to 30 cents per download directly from our banners. Some of the PRIVATE WiFi banners contain download options which pay affiliates based on a pay per click model. 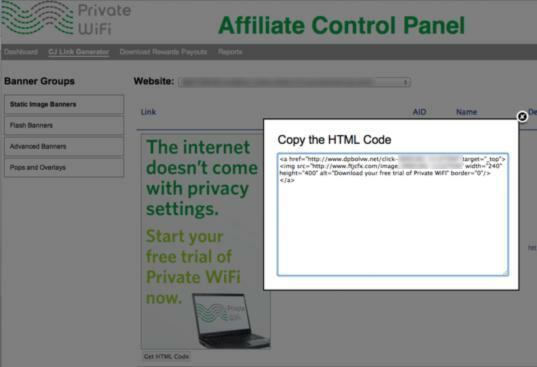 These banners allow users to download the PRIVATE WiFi software from the banner without ever leaving the affiliate site. You can find these banners in the CJ smart-links that take you to our link generator or by logging into our Affiliate Control Center and going to our Advanced Banner page at https://www.privatewifi.com/affiliates/cj_banner.php . You can find current payout rates for download rewards in your Affiliate Control Center at https://www.privatewifi.com/affiliates/download_reward_rates.php . 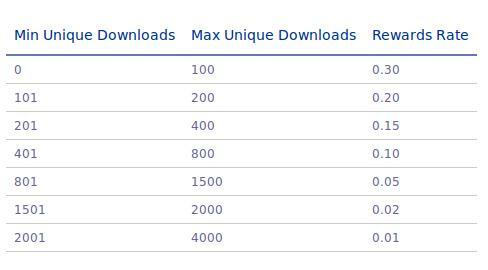 The Max and Min Downloads columns are based on the number of orders. For example, if for every 500 valid downloads you send to our software, you refer one order, then we will pay you ten cents per download. 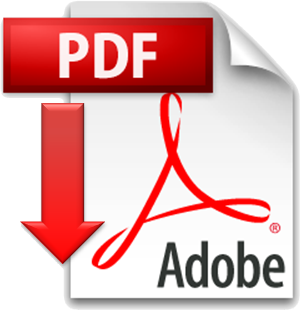 A valid download is based on the user entering a valid and unique email address in the download form. Please note that our system catches duplicate bounced emails. You can refer other affiliates and earn a revenue share from their earnings. If you have an Internet marketing-related website, you can refer affiliates to the affiliate program rather than actually selling the software. For this reason, we have created a Tier 2 affiliate level. If you are interested in becoming a Tier 2 affiliate, you will need to register with our affiliate portal at https://www.privatewifi.com/affiliates/. After you log in, you will find your customized Tier2 referral link on your Dashboard. You can use this link to send users to our sign up page so that they can become a PRIVATE WiFi affiliate and begin to earn commission for both themselves and you. Affiliates have some advanced capabilities when using PRIVATE WiFi's affiliate program. In addition to all the reporting capabilities found in the Commission Junction interface, affiliates can register in our Affiliate Control Center located at https://www.privatewifi.com/affiliates/ . Registration is easy. You will have to enter your company name and CID as it is listed in your CJ account. Once registered, you will be able to see your current and previous month earnings, as well as your estimated future earnings for all recurring commissions, download rewards, and Tier2 earnings. You'll also find various tools and banner generators to get you started.